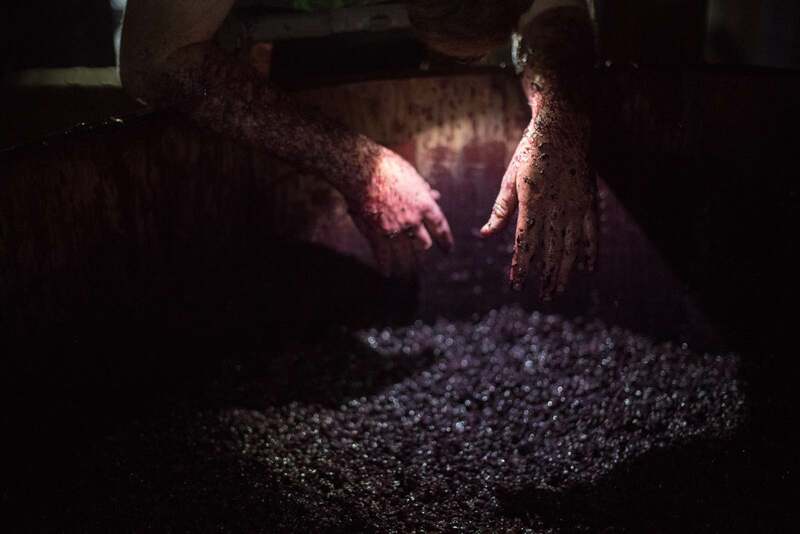 Aging for Mayacamas wines takes place almost exclusively in neutral oak, ensuring the style of the finished wine remains fresh, vibrant and pure. 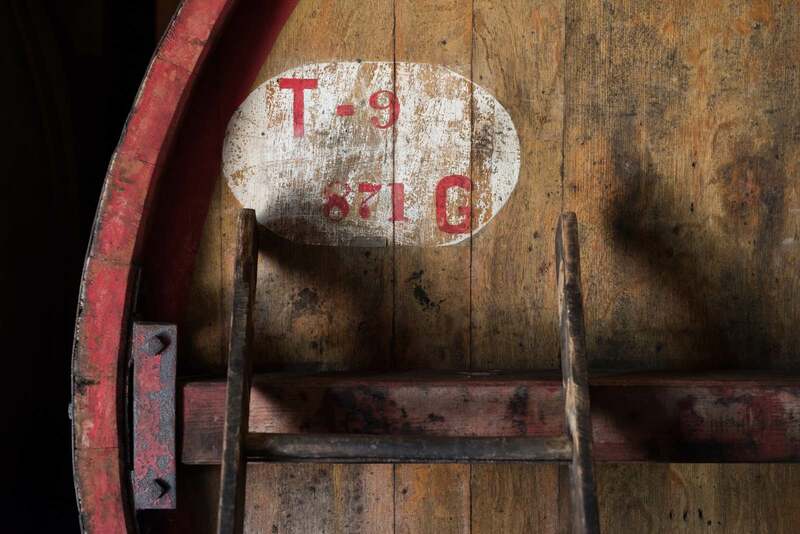 A significant portion of the ageing vessels are large format foudrés, some of which have been in continuous use in the Mayacamas cellar since the 1920’s. This commitment to large cask ageing is central to the unique style of Mayacamas wine, especially Cabernet Sauvignon. Jack Taylor surveys new plantings on the Top Block, one of the highest vineyard sites in the Napa Valley. Grapes have grown continuously on the Mayacamas property since the late 19th century, at elevations of up to 2400 feet above the Valley floor. 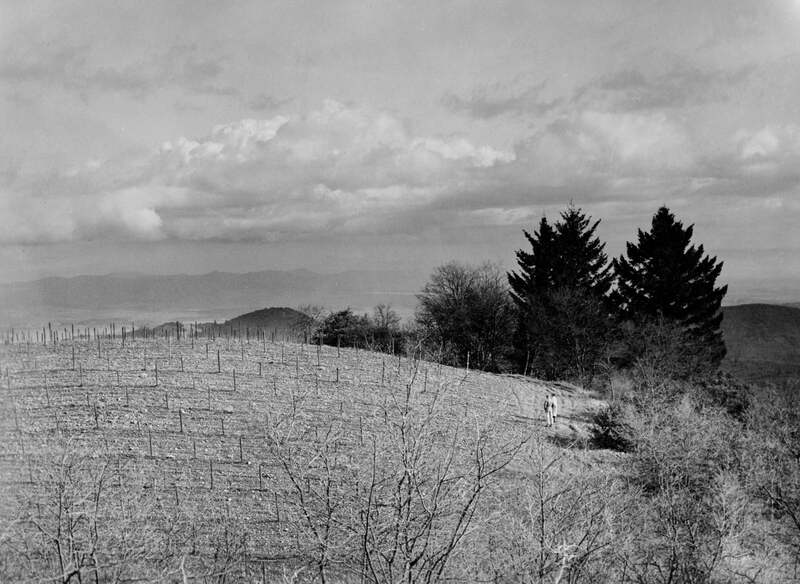 For almost 130 years, generations of vintners have worked the soils of the estate’s rugged mountaintop vineyards for tiny yields of intensely flavored mountain grapes. The Taylors, who owned the Estate from 1941 until 1968, were the first to plant Chardonnay and Cabernet Sauvignon vines – still the focus of the Mayacamas production today. Wine quality at Mayacamas has taken a significant leap forward under the new team’s watchful eyes. Beginning with the 2013 vintage, attention was focused both on continuing the long-standing history of classical winemaking while also exploring ways to improve quality for the future. All production spaces throughout the property were restored and respectfully improved to ensure consistency, cleanliness and precision in all aspects of the winemaking process, while still designed to embrace the nuance and charm resulting from old-world philosophy. Beginning in 2013, much of the Mayacamas estate has been respectfully replanted to ensure continued healthy productivity. Once established, all vines on the Mayacamas vineyards are dry-farmed to ensure low water usage and grapes with intense, concentrated flavors. This re-commitment to top-quality farming practices stands to be the most significant and meaningful improvement made to Mayacamas in decades. Bob Travers diligently documented all aspects of harvest and winemaking over his 45-vintage career as owner and winemaker of Mayacamas. 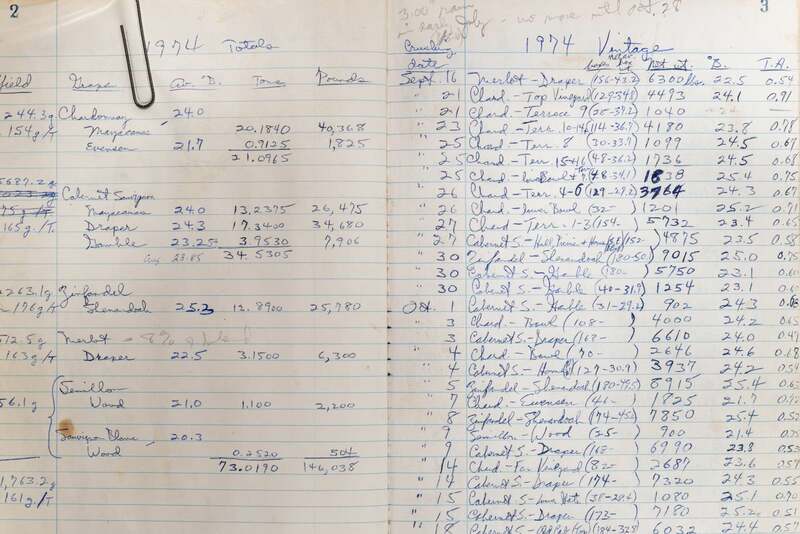 His notebooks, now an integral part of the winery’s historical archive, provide both insight into the winemaking methods of the past and a valuable framework for the future. Still today, Mayacamas wines remain among the most traditionally produced wines in America, with winemaking methods remaining consistent for generations. In addition to these notebooks, the extensive archive is filled with images, old newsletters, press clippings and much more from the estate’s long history. Jack Taylor surveys new plantings on the Top Block, one of the highest vineyard sites in the Napa Valley. Grapes have grown continuously on the Mayacamas property since the late 19th century, at elevations of up to 2400 feet above the Valley floor. For almost 130 years, generations of vintners have worked the soils of the estate’s rugged mountaintop vineyards for tiny yields of intensely flavored mountain grapes. 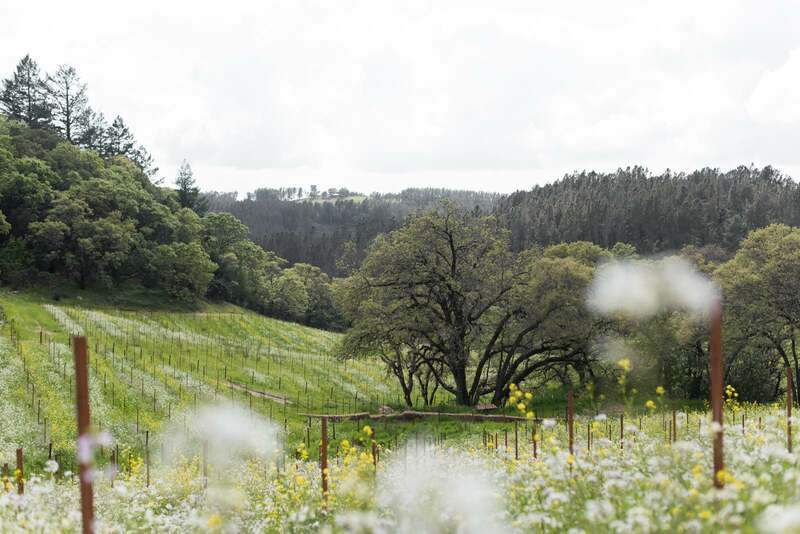 In 2013 the new team at Mayacamas Vineyards transitioned the 50+ acres of vineyard on the estate to organic farming, a decision representing a huge step forward for environmental sustainability and wine quality. 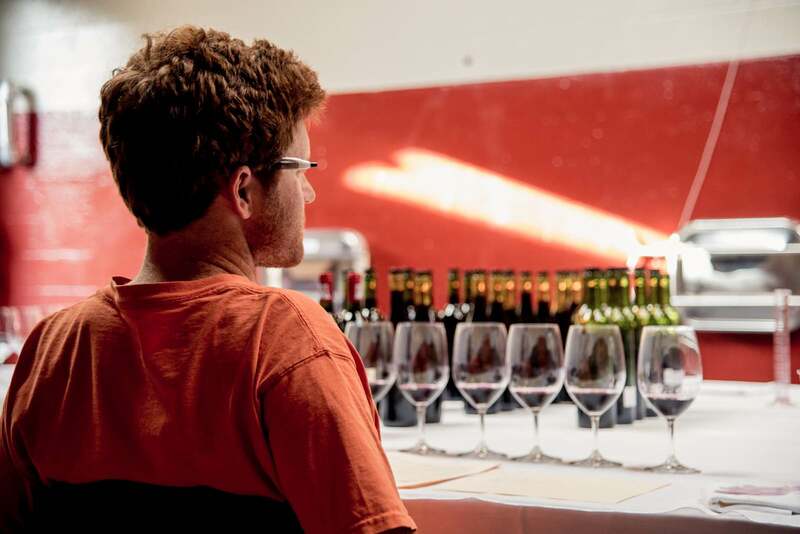 A winemaker checks an open-top Cabernet fermentation to assess its readiness for pressing. Mayacamas grapes are harvested early to preserve freshness and bright acidity. Constructed in 1889 by original founder John Henry Fisher, the stone winery at Mayacamas has remained in continuous use for almost 130 years. 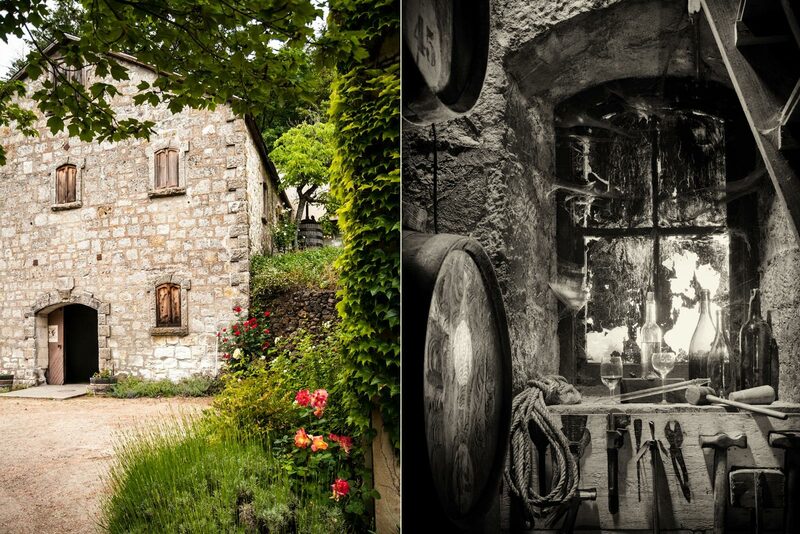 Over the decades, the winery has changed remarkably little – the ground floor ageing cellar remains intact and filled with tools passed on from previous generations. Built into the hillside from stones gathered around the property, every vintage of Mayacamas Cabernet spends at least 2 years barrel-ageing inside. 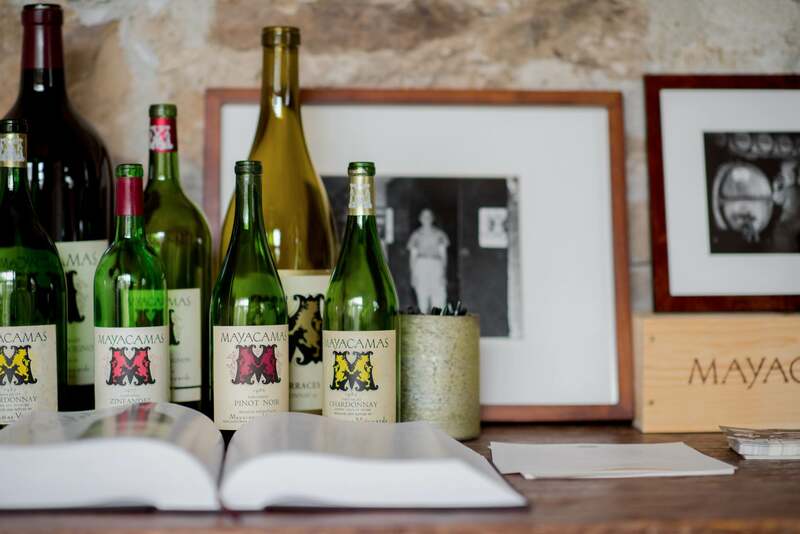 Wines old and new showcase bottled history – while many different varietals have been produced at Mayacamas over the decades, the iconic label has remained in place since the 1940’s. 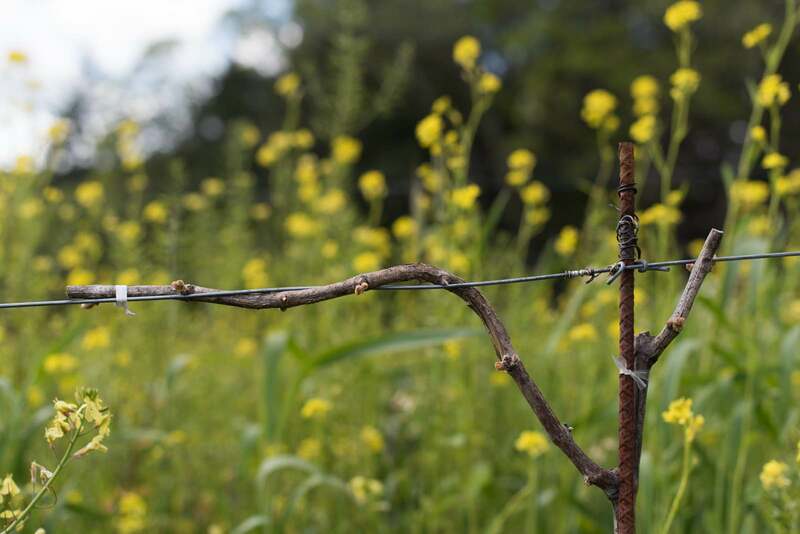 As Napa changes, Mayacamas remains individual. From all of us at Mayacamas, it is an honor to share our work with you as we steward this great estate into a bright future. 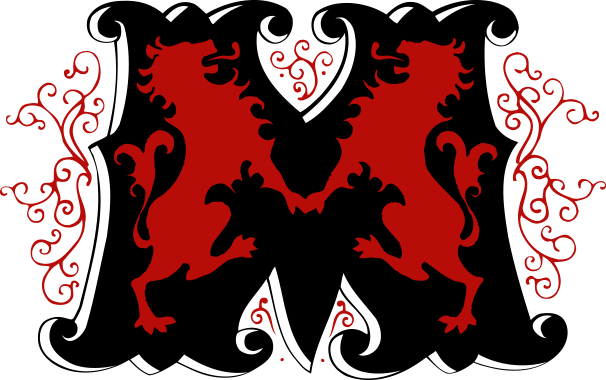 Join our Mailing List to purchase wine, or pay us a Visit.